This Honey and Lime Grilled Pineapple comes together in just minutes and is an instant, healthy taste of the tropics. Whisk together honey and lime juice in a bowl. Brush onto each side of the pineapple slabs. Heat either a grill or grill skillet to medium heat and grease well. Cook pineapples for about 3 minutes on each side, or until char lines develop, increasing heat if necessary. 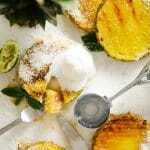 Transfer to serving plates, sprinkle with shredded coconut, and top with a scoop of coconut ice cream. Serve immediately. Recipe from Live Eat Learn at https://www.liveeatlearn.com/honey-lime-grilled-pineapple/.